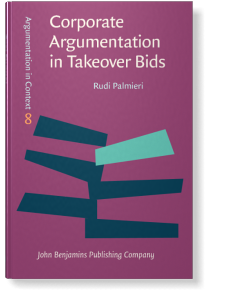 This volume systematically investigates the role of argumentation in takeover bids. The announcement of these financial proposals triggers an argumentative situation, in which both the economic desirability and the social acceptability of the deal become argumentative issues for different classes of stakeholders (shareholders, employees, customers, etc.). The study focuses on the strategic maneuvers that corporate directors deploy in order to persuade their audiences while complying with precise regulatory requirements, designed to allow shareholders to make reasonable decisions. A conceptual reframing of takeovers as an argumentative context brings to light the different argumentative situations of friendly and hostile bids. The argumentative strategies that corporate directors adopt in the two situations are identified and analyzed on the basis of a corpus of takeover documents referring to offers launched in the UK market between 2006 and 2010. The argumentative reconstruction focuses in particular on the inferential configuration of arguments, which is accomplished by means of the Argumentum Model of Topics (AMT). This kind of analysis enables capturing the inherently argumentative processes through which information becomes a relevant starting point for investment decisions.